Just about three months short of a year after he was awarded the Oscar, A.R. 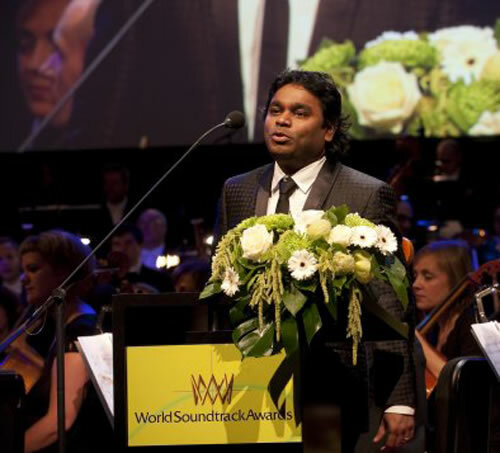 Rahman has done India proud on the world stage once again. This time, it is by being chosen for the World Soundtrack Awards of 2009. Rahman won the award in the ‘Best Original Song Written for a Film’ category for the ‘Jai Ho’ song in Slumdog Millionaire. He was also nominated for the Best Original Film Score which was eventually won by two-time Oscar nominee Alexandre Desplat who also won the Film Composer of the Year award for his work in ‘The Curious Case of Benjamin Button’ starring Brad Pitt. The awards ceremony was held on Diwali day, October 17, the last day of the Ghent Film Festival, in the Belgian port town of Ghent. Three time Oscar winner Marvin Hamslich was honored with the Lifetime Achievement award at the function. Rahman couldn’t have given a better gift to all his fans of the festival of lights. All this, while the ‘Jai Ho’ concert is still fresh in our minds. We simply can’t wait for more. Congrats and thanks Rahman…..